So, why are these not done? 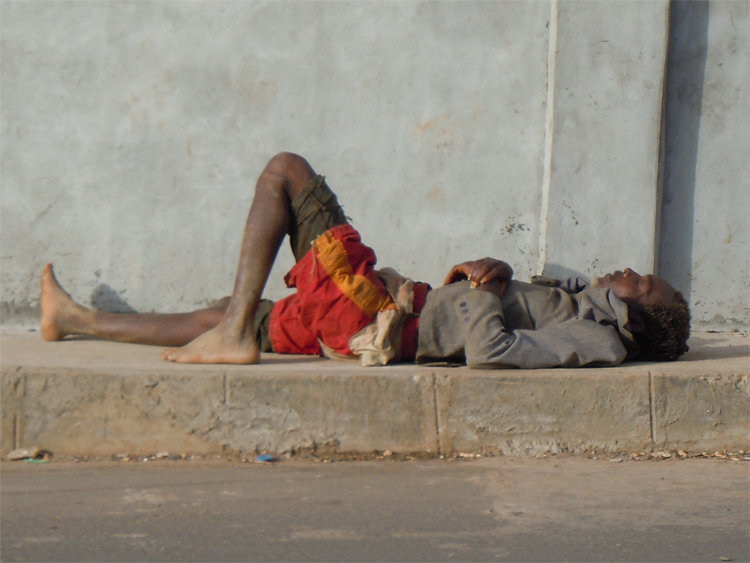 I focus here first on the observation that ICTs generally increase inequalities unless very specific actions are taken to ensure that the poorest and most marginalised are able to benefit. I then explore the various interests that tend to limit delivery of the above ten practices, focusing especially on the activities of the private sector, and especially hardware and software companies, connectivity companies and content developers. In so doing, I also draw on some of the increasing amount of empirical evidence that the use of computers in education is actually damaging learning. In drawing these reflections to an end, I argue that one way forward is to work towards new and effective models of multi-stakeholder partnerships for education, that address education as something much more important, much more complex, and much more exciting than merely as a vehicle for economic transformation. The Commonwealth Scholarship Commission in the UK has just announced the latest round of its exciting Professional Fellowships programme which is designed to enable citizens of ‘developing’ Commonwealth countries to spend time gaining relevant professional experiences in UK organisations. Any UK organisations can apply to host people for the scheme (for between 1 and 6 months duration), and any interested individuals are recommended to contact organisations that have previously hosted such fellowships, or that might be interested in hosting them in the future, to see whether they would be willing to nominate them. Individuals cannot apply directly to the Commission for these awards. The closing date for organisations to submit nominations is 7th October 2013 for Fellows to start between January and December 2014. Commonwealth Professional Fellowships support mid-career professionals from developing Commonwealth countries to spend a period of time with a UK host organisation working in their field for a programme of professional development. Fellowships are typically three months but can be between one and six months in length, and can include limited time for attendance at short courses or conferences, as well as visits to other organisations. Programmes must have demonstrable development impact in the Fellow’s home country and the Fellow must be able to show how the knowledge and skills they will gain during the Fellowship will be disseminated after their return home. Applications must come from an organisation in the UK willing to set up a programme and host the Fellow(s), or have the agreement of a separate organisation in the UK to act as the host (if the latter is the case, a letter will need to be supplied at the time of application to confirm the agreement). Organisations wishing to nominate a Fellow or Fellows will need to set up a suitable programme and identify the Fellow(s) themselves. A programme can include time spent within their own organisation, learning from colleagues in a structured manner and undertaking project work which meets their learning objectives, as well as time spent at other organisations within the UK and at conferences and a limited time on short courses. Funding can be given for programmes of between one and six months (though typically for three months). Justification is required for awards of more than three months. Applications are sought for programmes within the broadly defined fields of agriculture/fisheries/forestry, economic growth, education, engineering/science/technology, environment, governance, and public health. Organisations can apply to host up to six Fellows in one year. Fellows must be Commonwealth citizens, refugees, or British protected persons and must be permanently resident in a developing Commonwealth country. Fellows must normally have at least five years’ relevant work experience in the field within which they wish to undertake the Fellowship. A Commonwealth Professional Fellowship covers the living expenses for the Fellow as well as a return airfare to the UK. It also provides £800 funding support to the host organisation, with a budget of up to £3,000 available for attendance at conferences, on short courses, and other eligible costs. Commonwealth Professional Fellowships are not for academic study or research of any sort. 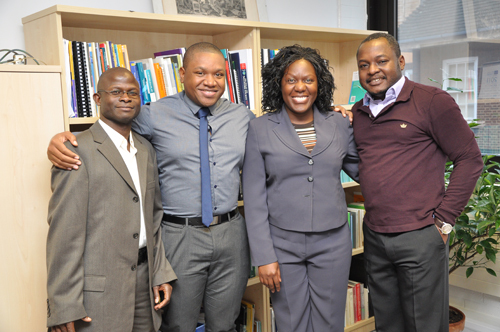 However, academics can be nominated for programmes of professional development in academic management. Commonwealth Scholarships for students from developing Commonwealth countries are offered for Master’s, PhD, and split-site (PhD) study in the UK. These scholarships are funded by the UK Department for International Development (DFID). There is a nominating agency for Commonwealth Scholarships in each Commonwealth country. In addition, universities and university bodies in a number of developing Commonwealth countries are invited to nominate candidates to the CSC. Each year, the CSC invites each nominating agency/university/university body to forward a specific number of nominations. Each nominating agency/university/university body is responsible for its own selection process, and in most cases they will set their own closing date, which will be before the CSC’s deadline for nominations (17 December 2013). Approximately 300 scholarships are awarded each year. The CSC invites around three times more nominations than scholarships available – therefore, nominated candidates are not guaranteed to get a scholarship. There are no quotas for scholarships for any individual country. Candidates nominated by national nominating agencies are in competition with those nominated by universities/university bodies, and the same standards will be applied to applications made through either channel. See Selection criteria – 2014 Commonwealth Scholarships for developing Commonwealth country citizens for further details. Please note that the CSC does not impose any age limit on applicants for its awards, but national nominating agencies may do so in line with their own priorities. Candidates may also find the Feedback for unsuccessful candidates in 2013 useful. All subject areas are eligible, although the CSC’s selection criteria give priority to applications that demonstrate strong relevance to development. You are requested to apply for a course of study at a UK university with which the CSC has a part funding agreement. All applications must be made through your nominating agency (or university/university body, if applicable) in your home country. You must check with them in the first instance for specific advice on how to make an application and for their own closing date. The CSC cannot accept any applications direct from candidates. The CSC expects all Commonwealth Scholarship candidates to be nominated by an approved nominating agency/university/university body, and to have completed an application form using our Electronic Application System (EAS). Full help on how to apply using the EAS is provided in our guides, which should be read in full before making any attempt to use the EAS. The EAS will close to applicants on 3 December 2013 and no further applications can be made after that date. The CSC will not accept any applications which are not submitted via the EAS to the nominating agency/university/university body in the candidate’s home country. Please note that all enquiries about these scholarships should be directed to the nominating agency/university/university body in your home country. 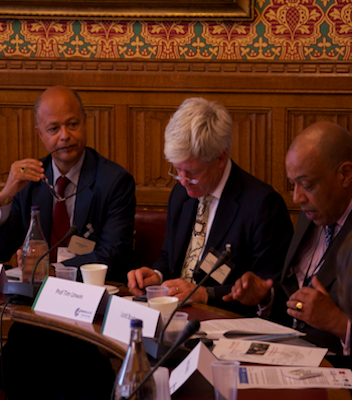 I had the pleasure of participating in the Planet Earth Institute‘s discussion on mobile technology for education in Africa, held on 5th June at the House of Lords. It’s interesting how such occasions, where one has to speak on the spur of the moment about important issues, provide a spur for innovative and creative thinking. The mix of the people, and the sharing of ideas really can generate new thoughts. The main point that I tried to convey throughout the event was that it is the learning that matters. Far too many initiatives are technology-led, rather than needs driven. Hence, mobile devices are absolutely not the solution for African education, although they can indeed help to deliver certain new kinds of learning opportunity. After all, as I mentioned, many years ago I engaged in mobile learning when I read books on long car journeys! Connectivity. To me, this is one of the biggest challenges for any ‘mobile-‘ initiative. Certainly people have developed simple SMS based learning solutions, and games that can function on basic phones and devices, but the difference between these and what can be done on smart-phones is huge. Smart-phones enable engagement with the wealth of resources on the web, and offer a completely different learning experience for people of all ages and backgrounds – if they can afford them (Cost!). So, providing mobile broadband solutions that everyone can access seems to me to be the most important challenge facing those who want to deliver high quality learning experiences through mobile devices. Hence, initiatives such as the work of the Broadband Commission and the Alliance for the Affordable Internet are of particular importance – but we must turn the rhetoric into reality! That’s one reason why the Commonwealth Telecommunications Organisation has placed such emphasis on the importance of mobile broadband in its current strategic plan. Charging (electricity). By this, I mean the importance of ensuring that it is easy and cheap to charge mobile devices everywhere. Electricity is absolutely essential for all digital technologies, and is all too often insufficiently considered when developing such initiatives. For those off the main grid, it is essential that simple, cheap and accessible means of recharging devices are developed and shared widely across the continent. Likewise, developing batteries that last much longer than at present is also an important consideration. My experiences in 2011 in rural China have given me lots of ideas about how this can be achieved – and where there are supplies of running water I have been very impressed with some of the micro-hydro initiatives that have been developed in south-east Asia. Communication rather than content. I have often written about this, but it seems to me that the really innovative thing about mobile-phones is that they enable entirely new ways of communication. Yet, far too often they are seen primarily as devices to supply/enable content consumption. I believe passionately that learning should not simply be about learning and regurgitating – yet our education systems seem to focus more and more on encouraging people to take on board accepted ‘truths’. Learning, should be about thinking for oneself, and coming up with new solutions to old problems! This is often best achieved through communication and interaction – the debating of ideas – and not just through digesting existing knowledge. Far too often, digital technologies associated with learning have reinforced regurgitation, rather than encouraging new ways of thinking. Hence, I want to shift the balance towards using devices for communication – they are, after all, mobile phones – rather than just for content consumption. Calculating (effective monitoring and evaluation). This is a bit contrived, but I could not think of a better ‘C’ for ‘monitoring and evaluation’! By ‘calculating’, I mean that we need to calculate the impact of our initiatives on learning achievements. Although many people talk about the importance of monitoring and evaluation, there is far too little good and effective work in this area. If we do not understand the real effects, including the unintended consequences, of the use of mobile devices in learning, then we cannot really determine how best to implement initiatives at scale. We must also be much more open about our failures so that others can learn from our experiences. Hence, the lack of quality monitoring and evaluation is a real barrier. Commitment. This is hugely important. There must be real commitment to using mobile devices effectively for learning, rather than simply using content provision as a means of selling more mobile devices! I fear that all too often, ‘m-‘ initiatives are driven too much by commercial interests, often in alliance with those who see ICTs as some kind of silver bullet that will transform society for the better, rather than by the real health, learning or governance needs and aspirations of people. 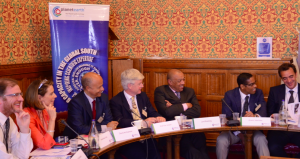 At the end, I was asked by Lord Boateng to sum up my thoughts about barriers, and simply said that the biggest barrier of all was our imagination! If we really focus on the learning, and develop innovative solutions whereby everyone can use mobile devices to enhance their lives, wherever they are living, then, and only then, can we talk about real m-development. I am deeply humbled that the ICT4D Collective and Research Centre that we tentatively created at Royal Holloway, University of London, back in 2004 has just been recognised as the world’s 10th top Science and Technology Think Tank in the 2012 Global GoTo Think Tank Report launched at the World Bank and the United Nations in New York last week. This accolade is all the more special because the ranking is based very largely on peer review, and therefore reflects the opinions of many people in the field who I respect enormously. More than 1950 experts and peer institutions participated in the ranking process for the report which was produced by the Think Tanks and Civil Societies Program at the University of Pennsylvania. The Collective was established above all else to bring together colleagues who are committed to undertaking the highest possible quality of research in the interests primarily of poor people and marginalised communities. Its work is premised on the assumption that ICTs can indeed be used to support poor people, but that we need to work tirelessly to overcome the obstacles that prevent this happening. 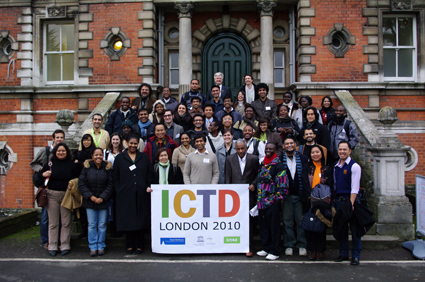 In 2007, we were delighted that the Collective and Centre was given the status of the UNESCO Chair in ICT4D, and although I am now only an Emeritus Professor at Royal Holloway, I am very privileged that for the time being I retain this title while also serving as Secretary General of the Commonwealth Telecommunications Organisation. It is great to be able to draw on my past research and teaching experience in this new role, to help governments across the Commonwealth use ICTs effectively and appropriately for their development agendas. 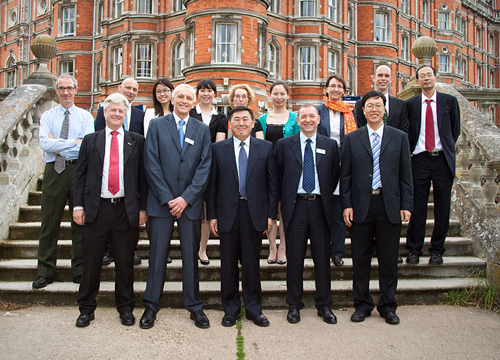 Then, in 2009 Royal Holloway, University of London, formalised the position of the ICT4D Collective by creating a new multidisciplinary research centre on ICT4D, that brought together expertise primarily from the schools and departments of Geography, Computer Science, Management and Mathematics (Information Security), with contributions also from colleagues in Earth Sciences, Politics and International Relations, and Information Services. This provides really excellent opportunities to develop new research at the exciting boundaries between disciplines. Over the eight years of the existence of the ICT4D Collective, we have focused on a wide range of activities, but have particularly sought to serve the wider interests of all researchers and practitioners working in the field of ICT4D. 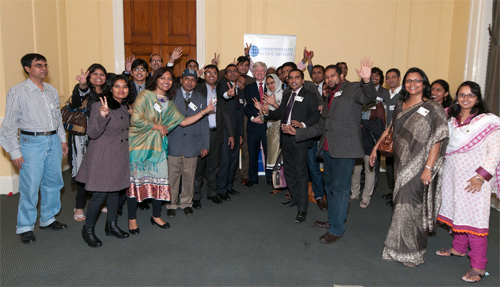 We were thus delighted to host the 2010 ICTD conference, which brought more than 500 colleagues to our campus, and we were immensely grateful to the generous sponsorship from global institutions that enabled us to provide scholarships for people to attend from across the world (pictured above). We have also focused much attention on supporting doctoral researchers, and it is excellent to see them now flourishing in their subsequent careers. Most recently, under new leadership, the Centre is continuing to thrive, and has launched an exciting ICT4D strand within its established Master’s programme on Practising Sustainable Development. In 2012, a Branch of the UNESCO Chair in ICT4D was also established at Lanzhou University in China, reflecting the growing collaboration between our two institutions, and recognising the huge importance that China is increasingly playing not only in terms of the practical implementation of ICT initiatives, but also into research in this area. A huge thank you to all who suggested that the ICT4D Collective and Centre should be recognised in this way. It is a massive spur to us all to keep up the work that we have been doing, and to share it more effectively with all those interested in, and committed to, using ICTs to support poor people and marginalised communities. I overheard a strange and depressing conversation about critical thinking at last month’s otherwise excellent Online Educa conference in Berlin. Ever since then it has been nagging away at my mind. So many of those involved in the conversation seemed to have a conceptualisation of critical thinking that is so totally at odds with my own! For many of them, critical thinking seemed to be something destructive, a form of negative criticism of the works of others. Critical thinking, in their views, was all too often damaging, destroying the confidence of young academics, and a means through which supervisors impose and re-enforce power relations over their doctoral students. This is so alarmingly different from my own perspective, that I feel I should share some of my thoughts here, not only to contribute to the debate, but also so that others may perhaps gain some insight into alternative views of critical thinking. Here, then, are my list of the ten most important aspects of critical thinking. First, critical thinking is something hugely positive. It should be very far from the negative caricature summarised above. It is a way of creating new knowledges, rather than simply encouraging the regurgitation of accepted truths. All too often, universities across the world today focus on teaching students accepted truths that they then learn and regurgitate in examinations, rather than liberating them to think for themselves. Critical thinking is therefore hugely creative, a way of encouraging people to craft new ideas that will hopefully better explain, or help us to understand, the world in which we live. It is fundamentally concerned with questioning and challenging accepted norms and arguments, weighing them up both through the power of reason and logic, but also through empirical experience to see which, for the moment, can continue to be accepted as approximations to some truth. My notions of critical thinking derive heavily from my engagement with the Critical Theory of the Frankfurt School, and especially the writings of Jürgen Habermas (notably Theorie und Praxis. Sozialphilosophische Studien, Neuwied, 1963, and Erkenntnis und Interesse. Suhrkamp, Frankfurt am Main, 1968). In particular, for me, Critical Theory provides two important underpinnings for critical thinking: its emphasis on the interests behind all knowledges, and its focus on emancipation. There is no such thing as value free science. All science or knowledge, is created by individuals, or groups of sentient people, for particular purposes. We must therefore understand these interests, and indeed our own interests, if we are to reach agreement on the extent to which such ideas can be accepted as accounting for any particular observations of reality. Critical thinking is in part about understanding the interests underlying any claim to knowledge. The ultimate purpose of critical thinking is about emancipation, both for the individual thinker, but also perhaps more importantly for the wider community of which that thinker is a part. Critical thinking is self-reflective, requiring a conscious consideration of how and why a particular set of thoughts comes into being. In this sense, it is an ancient tradition, going back at least to Socrates, but being developed by scholars such as Dewey (Moral Principles in Education, SIU Press, 1909), and more recently Glaser (An Experiment in the Development of Critical Thinking, Columbia University, 1941) and Ennis (Critical Thinking, Prentice Hall, 1996). Critical thinking is committed to action. This, again, derives in part from my own commitment to Critical Theory, but it emphasises that thinkers must also be actors. Unless knowledge is shared, in a sense liberated from the confines of the thinker’s own body, then its creation is a purely selfish, indeed arrogant process. If society permits some of its members to be set apart for thinking (most usually in universities), then it is incumbent on those thinkers to ensure that the outputs of their thinking are indeed used for the betterment of society. Critical thinking involves serendipitous rigour (about which I have written elsewhere). We need both to be rigorous in ensuring that we create places for serendipity, and likewise be rigorous in how we respond to serendipitous occurrences. Serendipity is essential to the creative aspect of critical thinking. Critical thinking requires clarity of method. I do not want to be prescriptive in defining any single particular set of methods, not least because many such lists already exist (Glaser, 1941; Fisher, Critical Thinking: An Introduction, CUP, 2001), but most of these focus on the importance of reason, logic, judgement, argument, inference and analysis. Finally, for me critical thinking is fundamentally about those who are privileged enough to be thinkers, using their thinking skills to enhance society and not just selfishly for themselves; it is, in particular, to use such thinking to help and enable the poorest and most marginalised individuals to improve their lives. This is not just about action (point 7 above), but about action committed to a particular social and political cause. There are, of course, many other aspects of critical thinking, but reflecting on that conversation in Berlin, these seem to me to be the most pertinent responses. Let me conclude, though, with a quotation from Herman Hesse’s Steppenwolf (Penguin, 1966, p.21), “‘Most men will not swim before they are able to.’ Is that not witty? Naturally, they won’t swim! They are born for the solid earth, not for the water. And naturally they wont think. They are made for life, not for thought. Yes, and he who thinks, what’s more, he who makes thought his business, he may go far in it, but he has bartered the solid earth for the water all the same, and one day he will drown”. I used this years ago as the introduction to one of my chapters in The Place of Geography and it still seems as pertinent now as it did then!